This year, Roger Dubuis proudly presents its new trilogy of designer watches created in close cooperation with Massaro, a French fashion house known throughout the world. This limited edition series of ladies luxury watches is represented by three stunning models that have already become the embodiment of imagination, inspiration, and creativity while staying extremely elegant, charming, and feminine. The new line belongs to the Velvet collection launched in 2012. 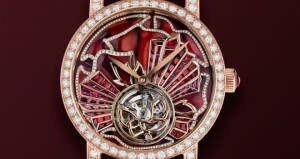 Although it is not as popular as the Lady Excalibur, its great women’s watches are still very recognizable largely due to their unique 36mm cases and multi-level dials. 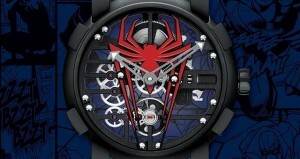 Moreover, each model from the Velvet series is equipped with a very reliable and precise in-house movement. As for the latest trilogy of Roger Dubuis designer watches – they are inspired by the iconic Hollywood Divas of the 1940s-1950s that makes them nothing more than high-quality artistic masterpieces. This gorgeous sample of Roger Dubuis new branded watches pays tribute to Rita Hayworth, a flame-haired silver-screen legend of the Golden Age of Hollywood. The Fiery Glow model comes in an 18k white gold case decorated with brilliant-cut diamonds and complemented with a pleated leather Haute Couture strap in gold tones co-designed by Massaro. 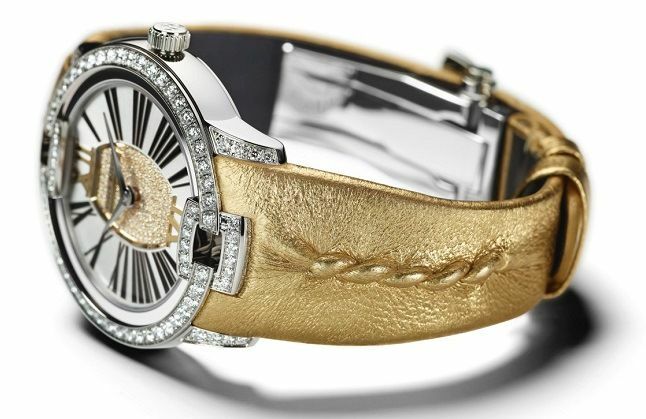 In addition, its beautiful dial with a satin sunburst exterior and radiating hour markers features the matching to the strap barrel-shaped Velvet center crafted in yellow gold and adorned with diamonds. The Pearly Iridescence model is dedicated to another Hollywood Diva of the 1950s, the platinum blond actress Lana Turner. 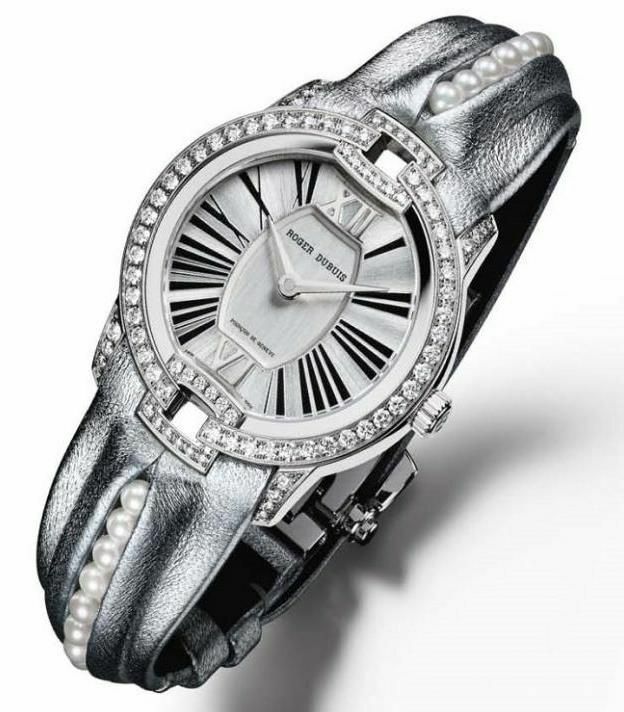 This elegant piece of luxury watches for women is distinguished by a silver leather Massaro strap with a row of pearls in its center. The matching 18k white gold case with a characteristic Velvet brushed dial is topped by a diamond-set bezel to underline the high style of this stunning ladies watch. The last model from the new Velvet by Massaro series is the glamorous Birds of a Feather. 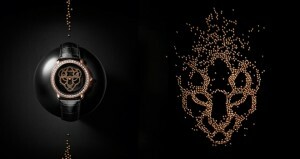 Such an exceptional sample of designer watches pays homage to the Hollywood actress beloved by many, Greta Garbo. 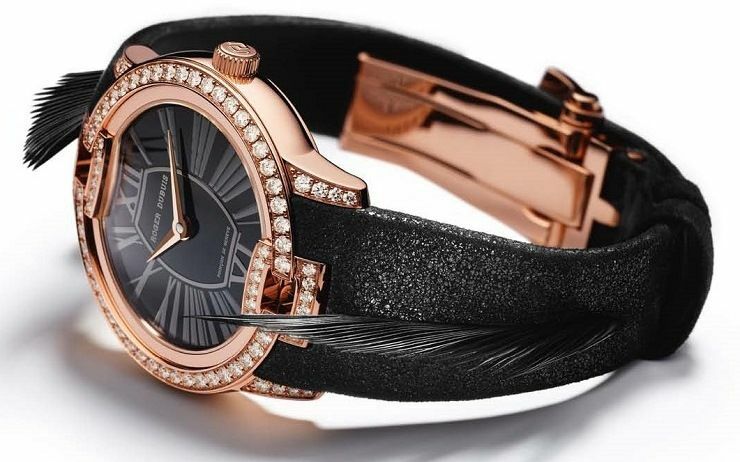 This version of brand new watches features an 18k rose gold case set with brilliant-cut diamonds and a black lacquered dial with charcoal hour markings and rose gold Dauphine hands. However, the most eye-catching detail of the Birds of a Feather model is definitely its dusky Massaro strap with interwoven black feathers. Each new representative of the Roger Dubuis Velvet collection of ladies luxury watches is equipped with an in-house self-winding mechanical movement with 48 hours of power reserve, stamped with the prestigious Geneva Seal, and has water resistance up to the depth of 30 meters. 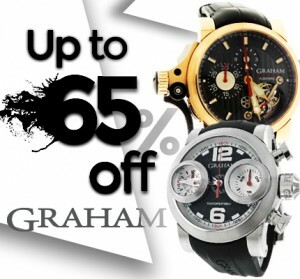 Moreover, each luxury watch model comes in a limited edition of only 88 pieces worldwide. So hurry up, if you want to get one of these masterpieces!